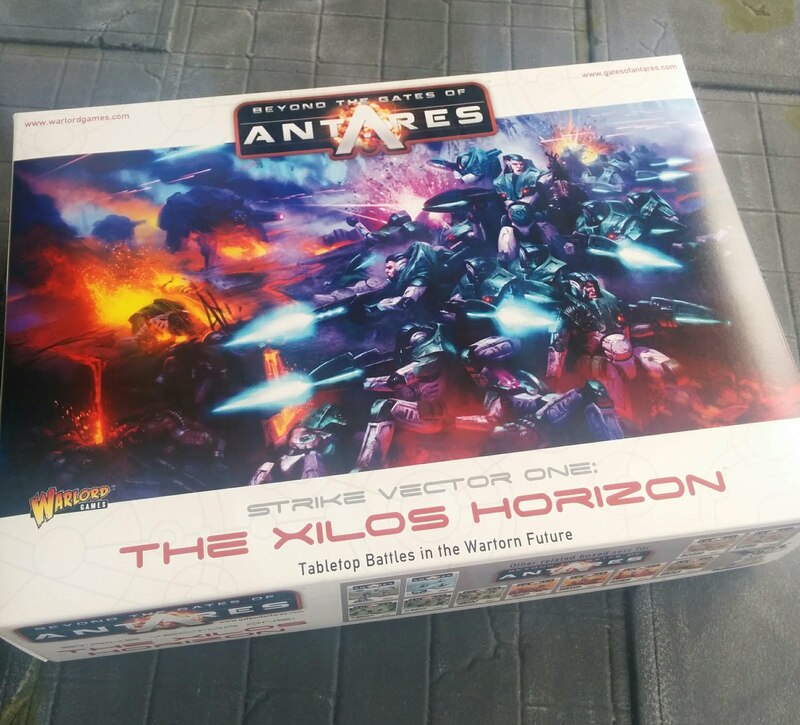 Quite possibly the miniatures game with the longest name I've ever encountered, Beyond the Gates of Antares: The Xilos Horizon, is Warlord Games’ major starter set for its 28mm Sci-Fi game of the same name. It retails for around £65 and pits the humans of the PanHuman Concord against the aliens of the hateful Ghar Empire. The game uses 10-sided dice for its mechanics, and shares many similarities with it’s WW2-era sibling Bolt Action. The Xilos Horizon takes place in the Seventh Age of the Antares universe. It is an age where humans have spread to the far distant reaches of space by means of the trans-dimensional portals, known as the Gates of Antares. It all began in an age long past, now known as the First Age, or the Prime Imperia. 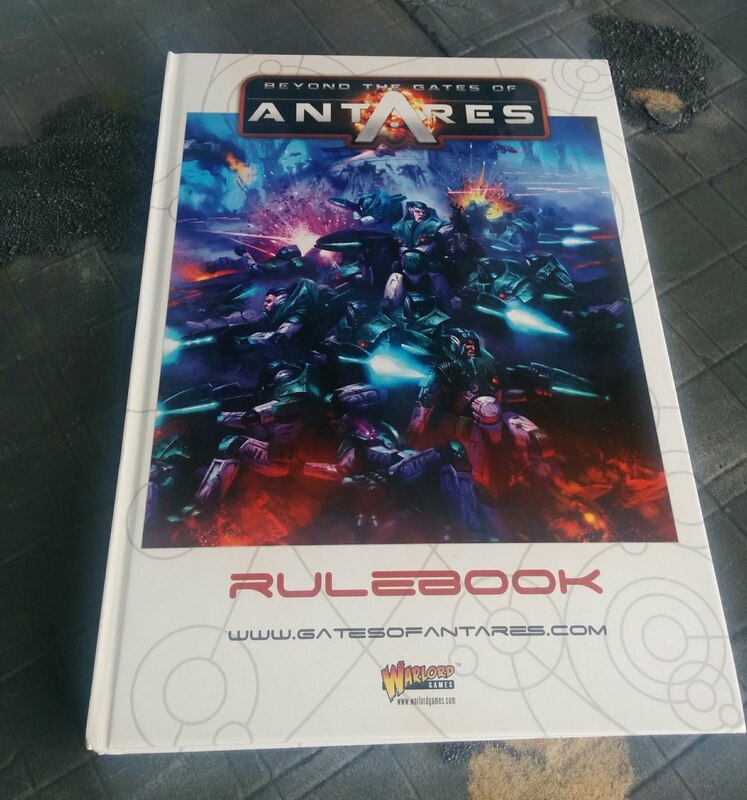 It was during this age that humanity first discovered the Gates of the mysterious machine Antares upon ancient Terra, and took their first steps into the worlds beyond, encountering alien races and populating far away worlds. But, as is often the case with humanity, they began warring over the new resources and lands. Eventually, Antares had its first of many collapses, all but destroying Earth and a multitude of other worlds. Only a handful of colonies avoided falling into barbarism during the collapse that lasted for centuries. So began the second age, the Renetal Ages, where the Gates of Antares began regenerating, and humanity rediscovered trans-dimensional travels. The age saw civilizations around the universe reach their highest peaks yet, with many of the technologies used later were first discovered. At the end of the age, Antares collapsed yet again, but this time the fall was not as great. The third and fourth ages saw the rise of the greatest empire yet, the Xon Dynasty. Ruling over almost all of the known universe for thousands of years, the empire eventually became divided and wars erupted between its new states and with the powerful alien Vorl race. After yet another collapse of the Gates, the fifth and sixth ages came and went, bringing not much else but war to the universe. Through these times, the ancient Isori still maintained a high level of civilization. With the sixth collapse of the Antares Gates, the seventh age began three thousand years later. 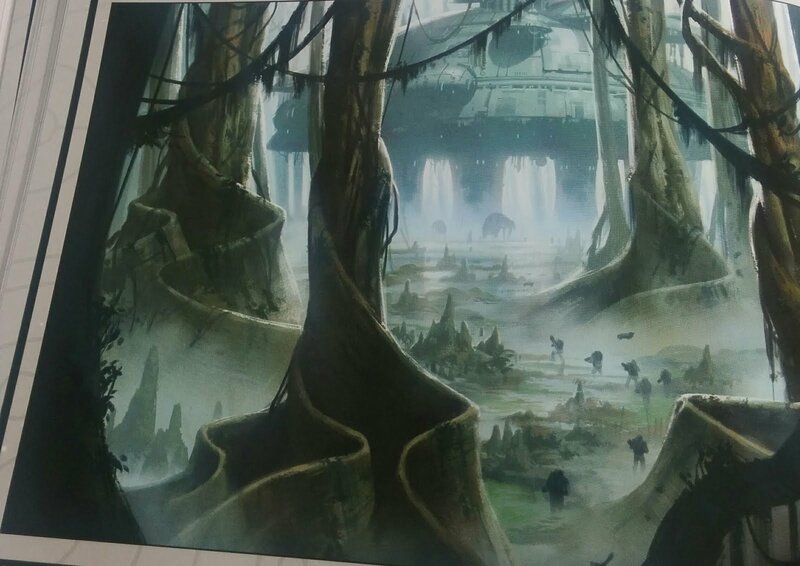 During the downtime of the Gates, the Isorians, the only empire still standing since the collapse of the first age, continued to advance their technology. Their recent discoveries led them to create the IMTel, or Integrated Machine Intelligence. Made of a nanospore-based Artificial Intelligence robots, the IMTel quickly spread through the galaxy when the Gates re-opened. The result was the creation of the other great empire of mankind, the PanHuman Concord. Today, most human worlds belong to either the Concord or the Isorians, both using the IMTel technology in different ways to integrate their citizens with machine interfaces. These two factions are great rivals and battles over most of the known worlds and resources. 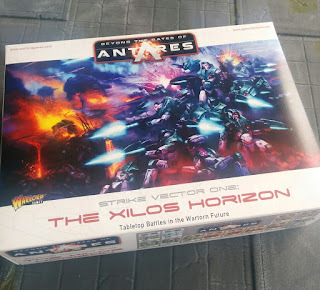 The first thing you notice when you pick up the bright, beautiful Xilos Horizon game box is how heavy it is, and when you flip the box over you’ll find out why. Not only do you get two starter forces, but you'll also the full, 288 page, hardcover rulebook as well. It’s not entirely usual, but very awesome, to have the full rulebook in a starter set, and you can tell Warlord Games really wants people who are interested in BtGoA to get this set. 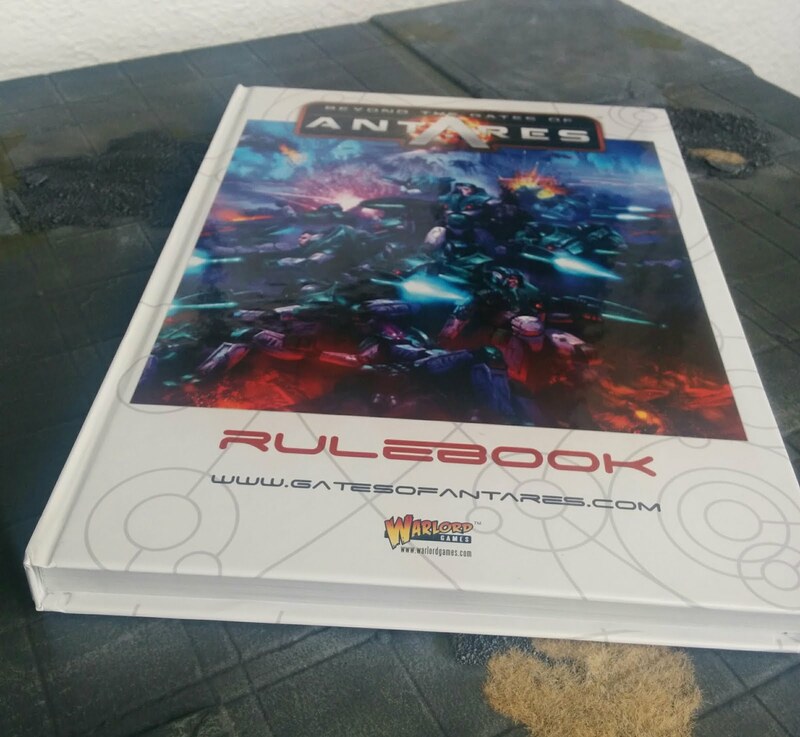 Besides the rulebook, there's a short quickstart guide that teaches you the very basics of the game, and a reference sheet that also serves as a box insert to divide the models and tokens from the rulebook. Smart move! The named hero comes in metal instead of plastic. 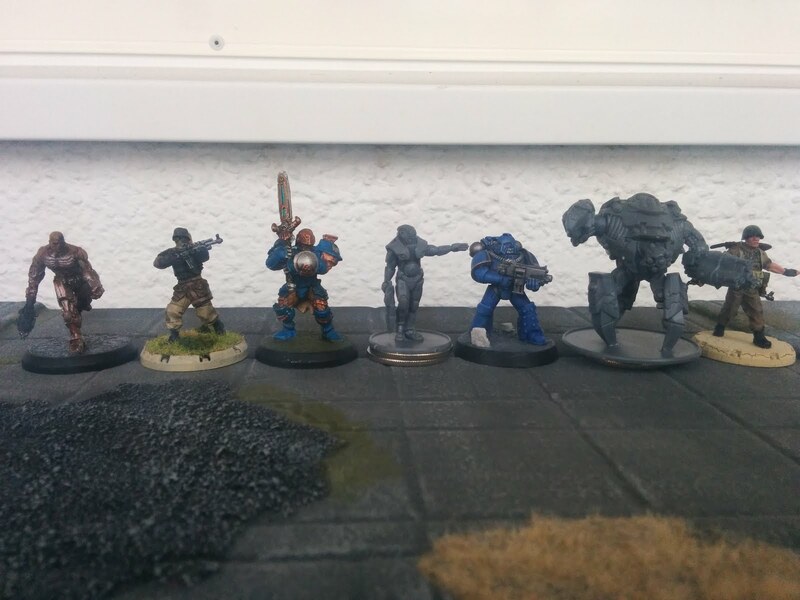 As is customary with tabletop miniatures games, the models all came unassembled. Fortunately, they all fit together nice and smoothly, and the excellent assembly guide made it all a breeze. Good job there, Warlord Games. 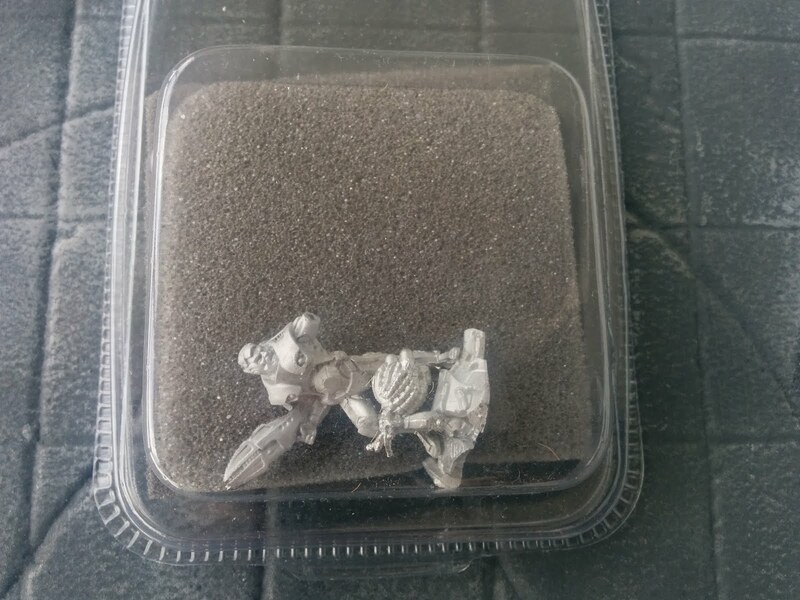 But...having assembled all the models (except the hero, Kai Lek), I could not help myself but getting the first doubts about this starter set. Do the forces in the pictures above look like an even match to you? They didn’t for me, so I quickly tallied up the maximum points (all points are in the rulebook) for the two forces so I could compare each army’s worth. I did not factor in any additional army bonuses, but included all unit options. The result came up as 500 pts worth of Ghar models, and 1050 pts worth of Concord models! 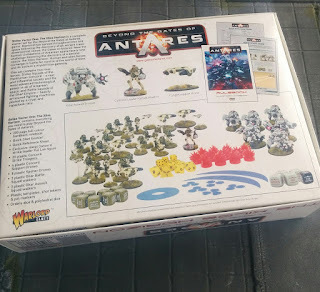 Seeing this, I searched through the box and rulebook to find any narrative or matched scenarios that were designed with just the starter forces in mind. Unfortunately, there were none to be found. This means that you will either have to play unevenly matched (points-wise) games, or just not use half of the Concord included. Either way seems bad to me. Besides all the miniatures, you also get enough markers and dice (D10 and special order dice), to play with the starter set’s forces. Warlord Games did a very good job on their suppression markers, as they are plastic tokens that can be turned to keep track of a unit’s suppression status. Although it is hard to see the small number on the tokens, that can be fixed by a quick drybrush of the numbers with a light colour. I definately prefer these plastic tokens over cardboard ones anyway. All the tokens you need, in plastic! Can you read the small digits on the Suppression token? There are no terrain pieces included in the Xilos Horizon. For seasoned tabletop players, that's not much of an issue as we are bound to have plenty of terrain laying on our shelves anyway. 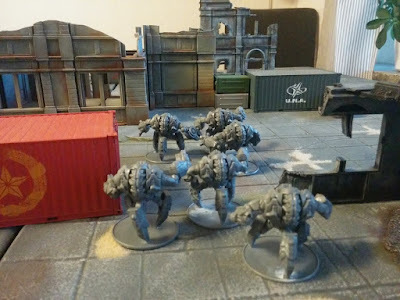 For new players it can be an issue, but I guess there are plenty of easy terrain to make from stuff at home that it might not matter much anyway. Still, a really good starter set should include at least one terrain piece to fight over in my opinion. 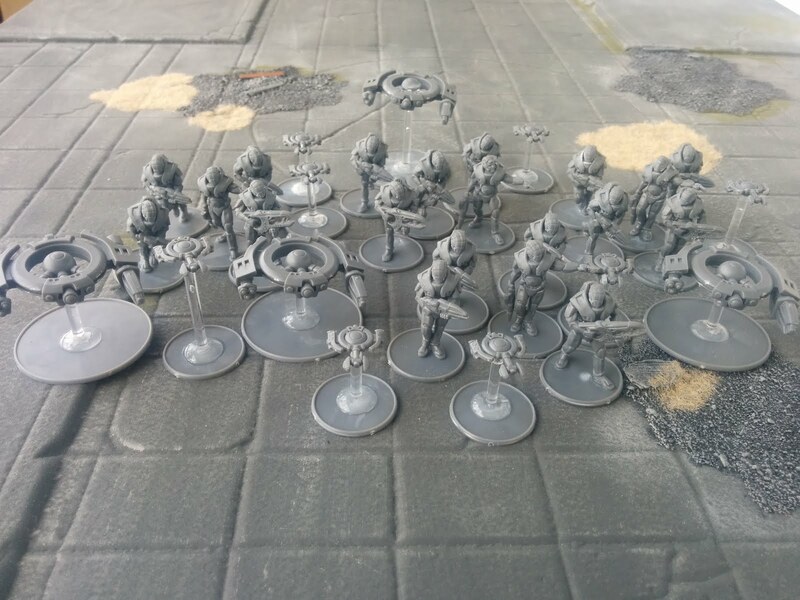 Example of unit cost: 122pts for five models. 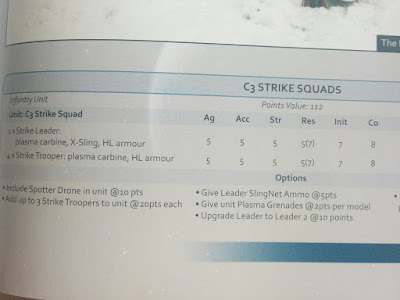 In the picture above, you can see the initial cost for a squad of five, as well as the cost of every upgrade available to it. 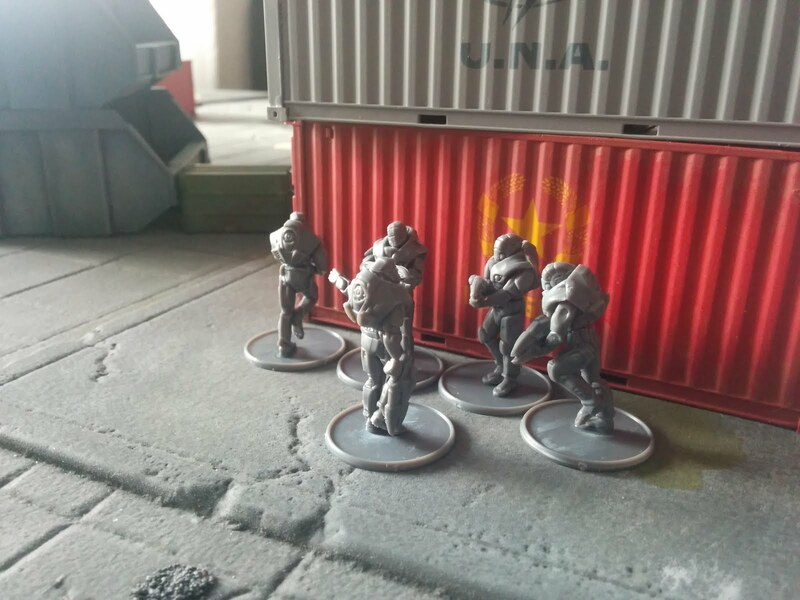 Once you’ve worked out a force and chosen the mission from one of the several included in the rulebook, the game begins with the deployment of your forces according to the mission played. Missions use different means of deployment. For those of you familiar with games such as Warmachine and Warhammer 40.000, where you move and shoot with your full army before your opponent does the same, Antares is something different. It utilizes a type of alternate activation system, much similar to its WW2 cousin Bolt Action (also from Warlord Games) where you and your opponent activate one unit at a time, and none of you knows who will get to activate next. 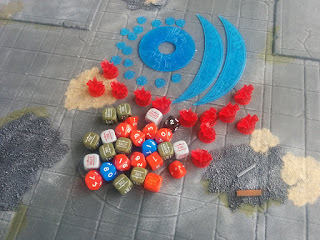 At the beginning of the first game turn, you put all the coloured Order Dice, one for each unit you have in the game, in a bag or some other place where you can’t see them. You then draw one die at random, and the player whose force corresponds to the colour of the dice gets to activate one of their units. This means that the same player can get to activate several of his or her units before the opponent gets a chance to activate one of theirs. In the long run this tends to even out, and also keeps a fun amount of uncertainty to the game where you need to plan ahead, calculating the risk of not getting to activate again. Once you’ve picked an order dice of your colour, you get to select one of your units that has not yet been activated, and perform an order with it. All the order dice show the six typically available orders, which is an excellent way of reminding players of their options available. 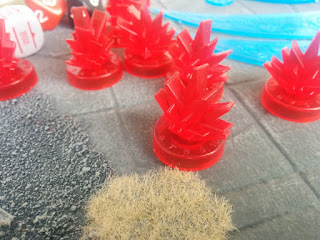 It also serves to show that a unit has activated, as you place the die next to the unit when it’s turn comes. 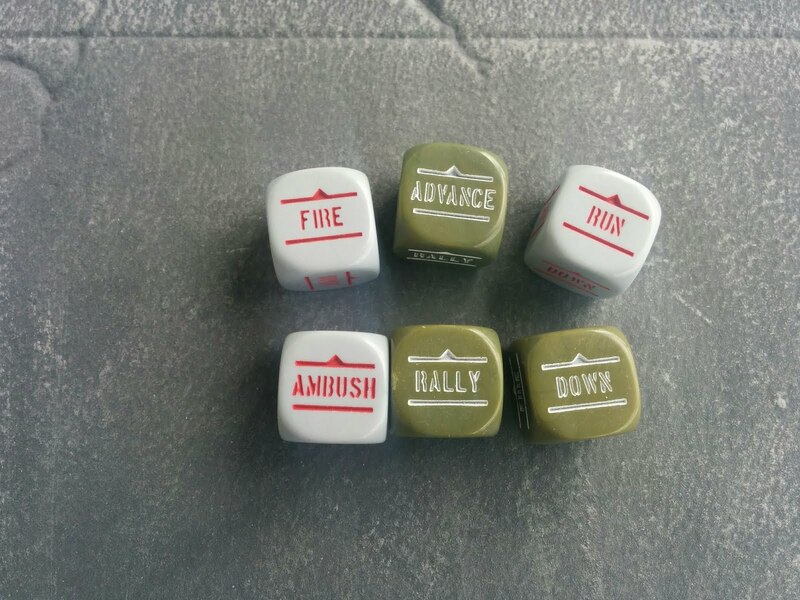 Order dice showing the six standard orders (actions) your units can do. The unit may not move, but fires their weapons with a higher accuracy. To shoot at a target, you get down there and check if your unit can see the target in a true line of sight fashion. If they can, you then look up the range of your weapon. Most weapons can reach very far in Antares, with a pistol reaching 30”, so you won’t find yourself out of range very often. 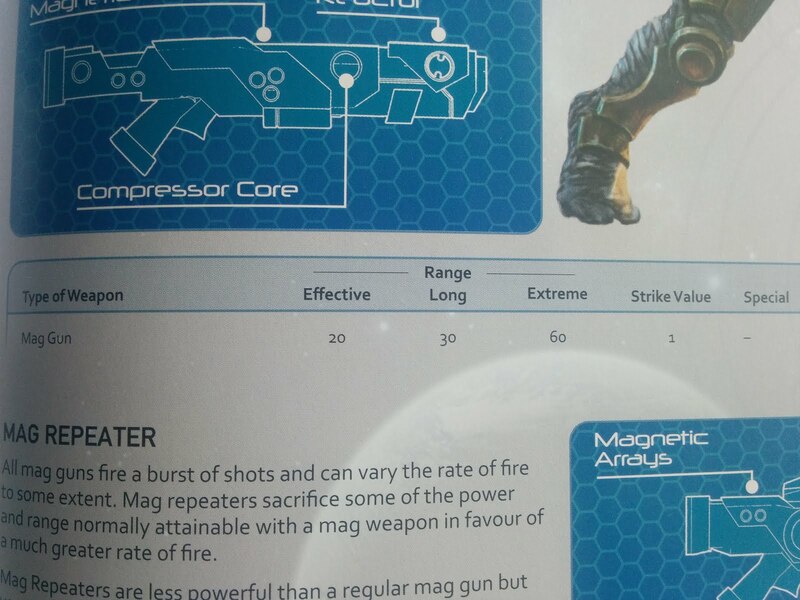 Weapon example - the Mag Gun. This standard weapon can fire up to 60"! Once you’ve made sure the target is within line of sight and range, you perform the attack. For each shot fired, you roll a D10 and see if the die score was equal to or less than the shooter’s Accuracy value. If so, the shot has hit and damage might have been done to the target. It’s not as simple as that however, as your accuracy value will be raised or lowered, depending on different factors. For example, firing at a target that has taken up a position in some rubble will net you -1 or even -2 to the accuracy value. With the fire order you trade moving for more accuracy, which means you instead gain +1 to the value. 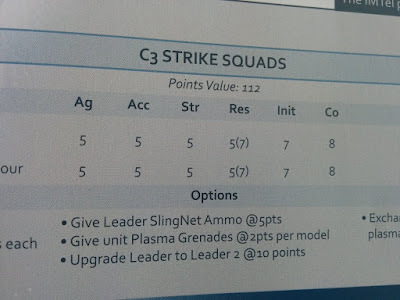 Example of a unit's stats. To cause damage to a target, scroll up and take a look at the Mag Gun profile above again. See that Strike Value of 1? 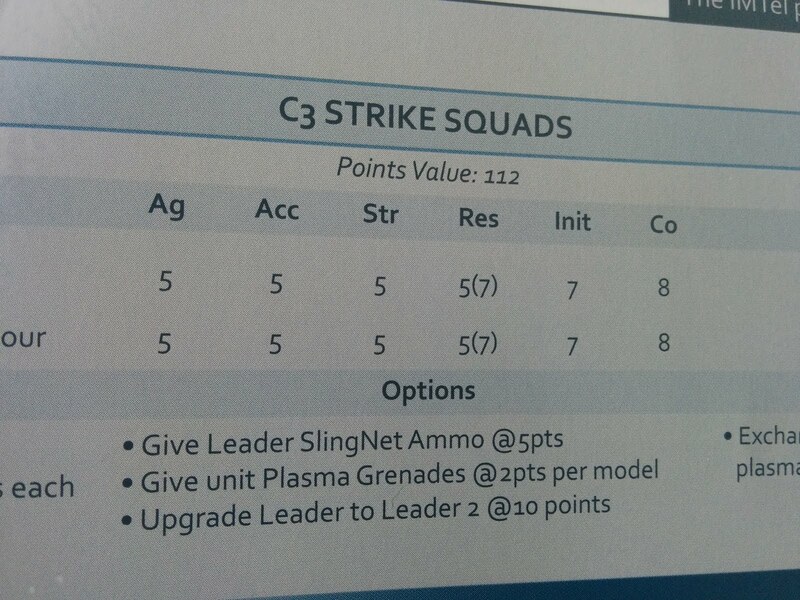 Now check the Strike Team profile and look at the Res value of 5(7). What last profile tells you is that a Concord Human has a natural resistance of 5 to damage, but clad in their armoured suits, they instead have a resistance value of 7. Take away any strike value from the gun, and you have the score a player must roll equal to or less in order to survive the damage. 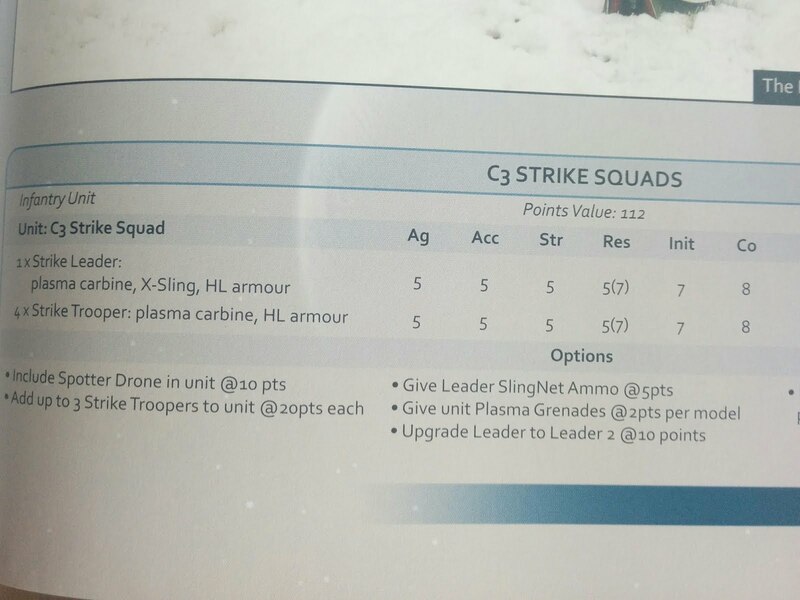 So, if a Concord Strike Team was hit by two Mag Guns, you roll two D10:s and for each roll of 6 or less, one squad member survives. Of course, there are additional rules to both shooting and damaging, such as shooting overhead as you peek out of cover without exposing yourself, or firing blast weapons, or firing multiple shots with the gun at the expense of accuracy. But the basics are very easy and works really well. This order allows for both movement and shooting, albeit without the bonus to accuracy you get when not moving, just shooting. For how shooting works, see above. 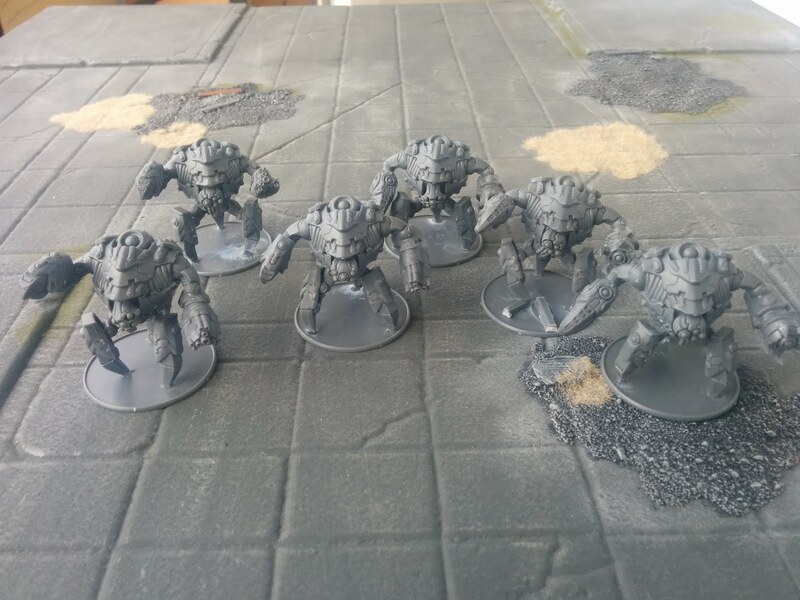 When you select this order, you may move each model in the unit up to 5”, and then fire any of the unit’s weapons unless they are too heavy to shoot on the move (as stated in a weapon’s profile). The basics of moving is easy - you measure from the base of a model and make sure it ends the movement no further away than is allowed. Depending on the type of ground you move across, the distance might be less than 5", as noted in the extensive list of terrain types in the rulebook. No Concord in sight, let's run across the open while we can. See that enemy unit hiding behind those trees over there, soon rushing forward to claim an important objective? If you want to keep them from reaching it, the Ambush order might be for you. In fact, as long as a unit of yours have not yet activated, you may simply claim that it is trying to react to an enemy. 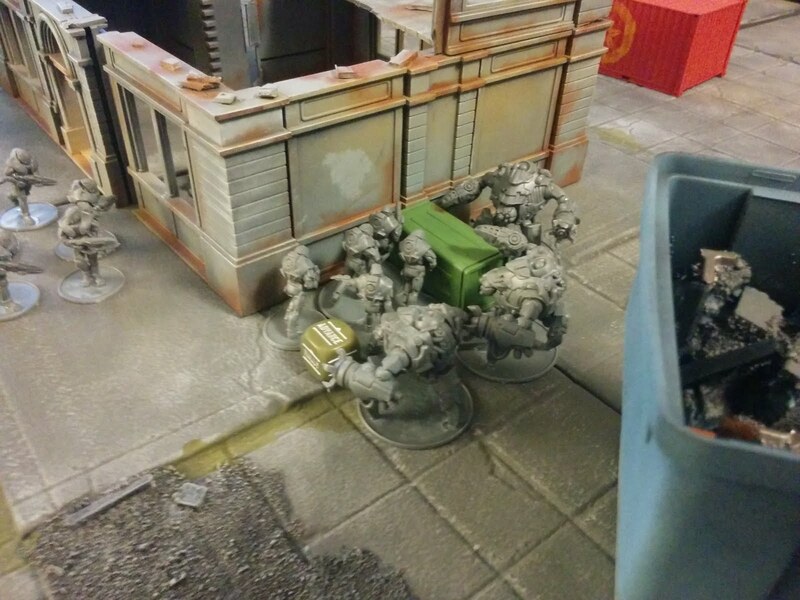 If you pass the ensuing initiative test, you place the Ambush die next to the unit and then do whatever it was you reacted to. If an enemy moves, you shoot it. If an enemy runs up to you and tries to kill you in melee, you run away. If an enemy shoots at you, you go down to the ground to claim better cover. This is an important tactical order in the game as it lets you react in so many ways to your enemy. After your unit has reacted, it keeps the Ambush order die next to them and count as having been activated for the turn. Get ready, men! The Ghar'll be here any minute now. As a follow-up to the shooting rules, I need to explain one of the basic and very important elements of the game, namely the Pinning rule. 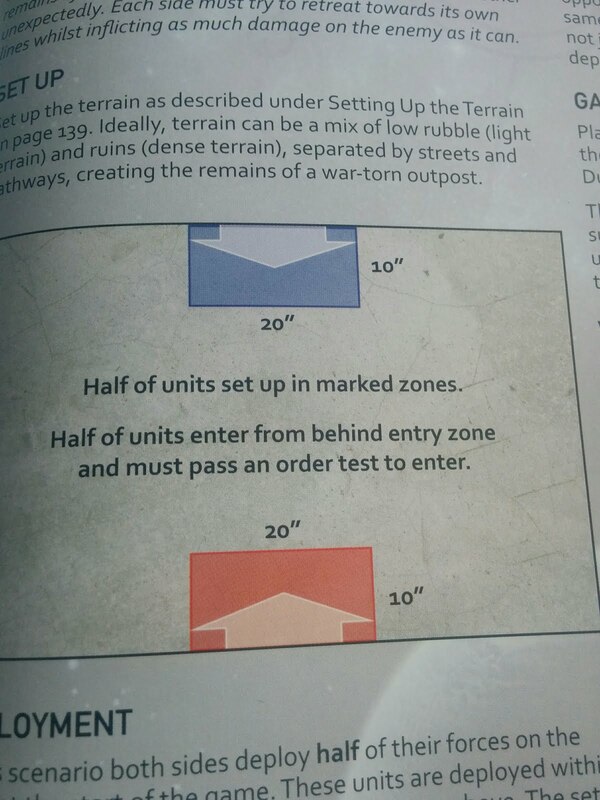 As units suffers hits and casualties, they become increasingly more pinned, forcing you to pass something called an Order Test whenever you want them to carry out an order. If you pass the test, your unit may go ahead with the order you selected for them. However, for every pin marker the unit has, it will perform the order worse. For example, the pinned unit suffers a -1 penalty to their accuracy when shooting or to their initiative when trying to react to enemy activations, for each pin marker on them. If you fail the order test, your unit does not perform the desired order at all, but Goes Down instead. No matter if you pass or fail the order test, your unit will remove one pin marker from it. Being under constant fire means you will often find yourself with more than one pin marker on a unit, and that’s where the Rally order comes in handy. Put this side of the order die next to a pinned unit, and the unit will remove up to seven pin markers (D6+1). This becomes even more important if you have taken many pin markers on a unit, because if it suffers too many it will eventually run away from the battle entirely! Wait, what? There’s a seventh order? If you use the Run order on a unit, and that unit reaches base-to-base contact with an enemy unit, there will be a melee combat between the two units. The first thing you and your opponent do is to shoot with any small and regular weapons (such as pistols and rifles) the assaulting unit and their target has. As your desperate squad bears down on its enemies, both units tries to blast each other apart before the chaos of melee begins! Once any casualties have been removed from said shooting, the actual melee takes place. As with the close quarter shooting, the melee also happens simultaneously for all combatants. The mechanics are very similar to how shooting works - you just exchange the accuracy value of the attacker with the Strength value instead. Most melee weapons have no strike value, so the resistance save of the target will seldom be modified. Ghar Walkers assault some poor Concord. Whichever side has the most Pin markers on them after an assault is the loser and must pass a test or be taken out of the game entirely. This make assaults very deadly and often a desperate last action as it can backfire on the assaulting unit instead. In any case, it’s always best to soften a target up first by shooting it, so it has at least a few pin markers on it before the assault! Certain orders, such as the Down and Ambush orders, might stay from turn to turn. But other than these exceptions, you collect all order dice during this phase and put them back in the drawing bag. Then a new turn begins by you drawing a random die and assigning an order as described above. 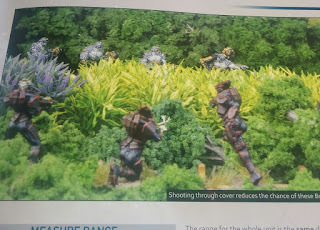 There are so many nice miniatures, plastic markers and on top of that even a hardcover rulebook, that it's easy to like the Xilos Horizon at first. But in the end what matters most in a review of a starter set is how well it plays with the forces included, and sadly, that's where this game falls abit short. The basics of the game works well enough, is easy to remember and feels fluid in the gameplay. But, in addition to the basic rules, there are tons of special cases, exceptions, and additional rules for each section of the game. 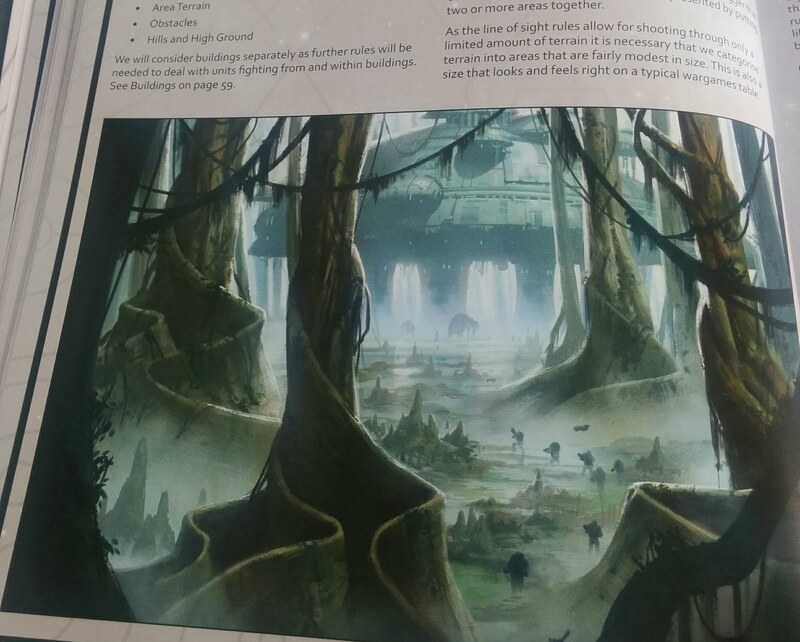 For example, there are 27 different terrain types in the rulebook! It even makes a distinction between Rocky Ground, Rubble, Broken Ground and Ruins, although several of them have pretty much the same in-game effect. Unfortunately, all these additional layers of rules clutter the rulebook and the game, forcing you to look up many rules as you play unless you play so often you remember them all. This type of cluttered rules has been an issue with certain other similar games as well (looking at you Warhammer 40.000 7th edition), and while BtGoA isn't as cluttered as that other game, there are still too many exceptions and additional rules for it to feel intuitive. More details and exceptions does not equal a better game. As there are no special scenarios for the Ghar vs Concord forces, and the Concord has almost twice the amount of points, this is another area I just don’t see the starter set as living up to its potential. If you're going to play the Concord, then sure, there’s enough stuff in this set to be totally worth it. The Ghar on the other hand, gets less stuff to be impressed with, a meager two units of three Battlesuits each doesn't count for much in the long run. While sporting an excellent resistance value of 12, only failing their resistance saves on a 10 as that is an auto-fail, they will still go down to the amount of fire the Concord can dish out. 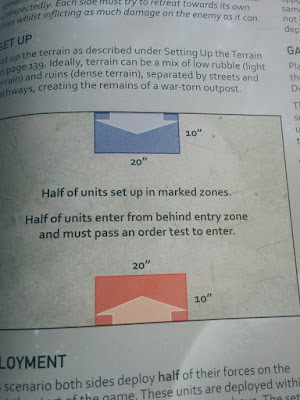 The issue with just two units also shows in many of the rulebook's missions, that include a scoring rule that makes you auto-lose the mission once half of your units have been taken out, or score additional points for each unit that left the battlefield through the enemy deployment zone. Compare the Ghar's meagre two units to the Concord's possible eight units and you'll see the problem with both of these scenarios. Also, not having a reference sheet of all stats of the models included is a mistake - you don’t want to look your units up in the rulebook when it would have been so easy to just include this info on a separate sheet for the starter set's units. You can download reference charts for the weapons from Warlord Games website, so that’s a nice addition, but it wouldn’t have cost them much to have that sheet already in the box. An excellent Concord starter army, well working basic game rules, hardcover rulebook with the full rules included. Lack of a varied Ghar force, lacks scenarios suited for the forces included in the set, lots of detailed but complicated rules clutters the game. An OK tabletop miniatures game, but a bad starter set overall, that sadly does not live up to its strong potential.